Over the summer, I invited a couple of girlfriends to take a superfood cooking class at my local Sur La Table, which has a teaching kitchen. 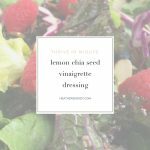 I particularly loved the mixed berry salad we made with this chia seed vinaigrette. It's so bright and citrusy with the right amount of balanced sweetness. Chia are fantastic because they contain a ton of fiber, omega three fatty acids, and all of the amino acids the body needs. The tablespoon of chia seeds in this recipe contains more calcium than a glass of milk! 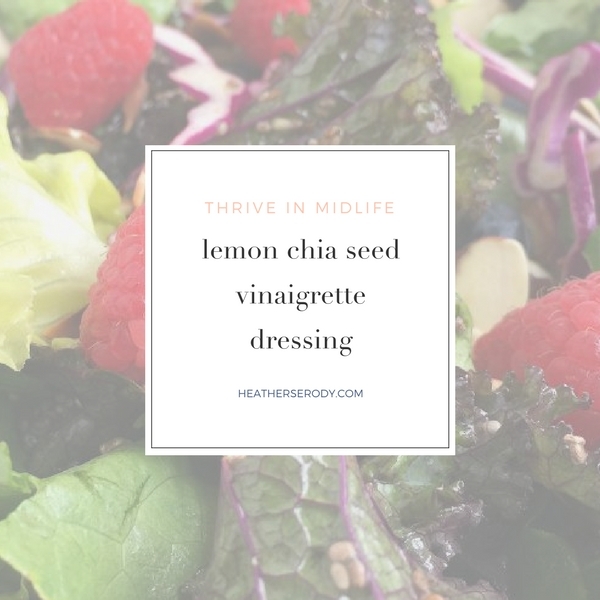 This vinaigrette pairs the chia with lemon juice – which impart antioxidants, vitamin C, and alkalizes the body along with the raw apple cider vinegar. As the chia seeds expand, the dressing naturally thickens; without the need for a ton of oil, too. Dressings like this that have good clinging power are great to pair with curly lettuce like kale – you just have to get down and dirty with it and massage it in with your hands. My version has a less chia than their recipe and a little less vinegar, too, Experiment with the ratios to your taste…if you want more or less. I used a mix of purple curly kale and bibb lettuce, shredded purple cabbage, toasted slivered almonds and fresh berries for this salad. But experiment with your own favorite and let me know if you like it as much as I do. In a small bowl whisk all ingredients together until combined. Allow vinaigrette to thicken, 20 minutes or so, stirring occasionally.